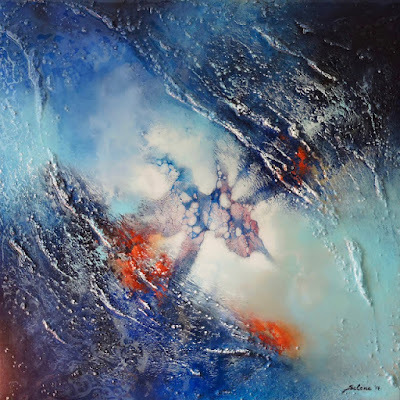 "The Rip in Spacetime," by Selene's Art. Used with permission. Yesterday, a very interesting essay was published on Scientific American by philosopher Susan Schneider. It offers an argument against panpsychism—the notion that experience is a fundamental aspect of all matter—based on the fact that new quantum gravity theories indicate that spacetime is emergent, instead of a fundamental scaffolding of nature. The key claim in the essay is that experience presupposes time; that the sense of flow we have in experience requires a pre-existing temporal scaffolding. Schneider's intuition informs her that "Timeless experience is an oxymoron." Therefore, if experience depends on time, and time is itself emergent instead of fundamental, then experience cannot be fundamental. Ergo, panpsychism is false—or so the argument goes. Here, the panpsychist could retort that our ordinary sense of time is an illusion. ... This Einsteinian picture has been called a static, “block universe” view of spacetime because it lacks any sense of a flow or passage of time. As Einstein wrote, upon the passing of a close friend, “For us believing physicists, the distinction between past, present and future is only a stubbornly persistent illusion.” Could the panpsychist appeal to this block universe picture to argue that time is an illusion? If so, perhaps panpsychism and quantum gravity are not at odds, after all. Suppose that our ordinary sense of duration is just an illusion, and reality is timeless. If this is the case, the point shouldn’t be that the fundamental layer of reality is experiential. The point should be, instead, that fundamental reality is nonexperiential. I scratched my head with this passage at first, for its conclusion seems to me to contradict the preceding discussion. But upon re-reading the passage, Schneider's intended meaning became clear to me: for her, if time is an illusion, then experience itself must also be an illusion, since in her view experience presupposes the passage of time. And then, if experience is an illusion, the universe must be fundamentally non-experiential—or so her argument goes. "The trouble with this," in the words of Galen Strawson, "is that any such illusion is already and necessarily an actual instance of the thing said to be an illusion." In other words, the alleged illusion of experience would already itself be an experience, so the claim actually reaffirms the primacy of consciousness: there has to be something experiential preceding the illusion of time, wherein the illusion itself could arise. Consequently, the implication Schneider is attempting to establish—namely, that if time is an illusion reality must be fundamentally non-experiential—doesn't actually hold. Schneider unknowingly begs the question already with her very first intuitive assumption: that timeless experience is an oxymoron (I shall attempt to help you see through this faulty intuition below; for now, please bear with me). Although I don't think Schneider's particular argument here works, I do think it is valid, in principle, to use physical reasoning to question the tenability of panpsychism. I say this because, by positing that experience is a property, or the categorical basis, of matter, panpsychists are trying to insert experience into an evolving theoretical framework in physics. As that framework evolves, valid arguments against panpsychism may congeal. The more important question for me, however, is this: Does Schneider's argument threaten, in any way, my own idealist view—elaborated upon extensively in my new book, The Idea of the World—that the physical world itself is a phenomenon of, and within, universal consciousness? The answer is no. Allow me to elaborate briefly. Schneider's main premise—which she posits as an axiom of intuition, without further justification—is the notion that experience presupposes time; that experience unfolds in time. For an idealist, however, time is itself a quality of experience. In other words, for the idealist time is in experience, not experience in time. This is the precise opposite of Schneider's axiom. So idealism lives or dies for reasons entirely unrelated to Schneider's argument. The latter does not apply to idealism. As a matter of fact, the entire physical universe—spacetime, matter, energy, fields, the whole shebang—unfolds, for the idealist, in universal consciousness, as a phenomenon of universal consciousness. Unlike the panpsychist, the idealist is not inserting consciousness in the physical universe, as a fundamental aspect of the latter, but inserting the physical universe in universal consciousness, as a manifestation of the latter. 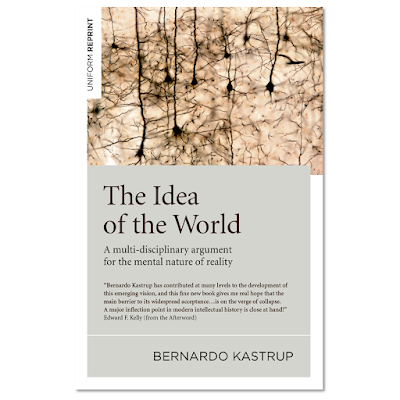 The challenge for the idealist is to make this work in a parsimonious, logically consistent and empirically robust way, as I've tried to do in The Idea of the World. Therefore, the possibility that time is emergent is not at all a problem for the idealist: time emerges within consciousness as a particular class of phenomenal states, consciousness itself being fundamental. Although quantum gravity theories are speculative today, the possibility of their success poses no new issue for the idealist. In fact, these theories help establish a key tenet of idealism: that the spacetime scaffolding is not fundamental. Nonetheless, since Schneider invokes the intuition that experience presupposes time—think of the sense of flow inherent to experience—my assertion above may sound counterintuitive at first: How can time be merely a quality of experience, if experience itself seems to unfold in time? Well, think of it: Where's the past? Is it anywhere out there? Can you point at it? Clearly not. So what makes you conceive of the idea of a past? It is the fact that you have memories. But these memories can only be referenced insofar as they are experienced now, as memories. There has never been 'a moment' in your entire life in which the past has been anything more than memories experienced now. The same applies for the future: Where's the future? Is it anywhere out there? Can you point at it an say "there is the future"? Clearly not. Our idea of a future arises from expectations and imaginings experienced now, always now, as expectations and imaginings. There has never been 'a moment' in your life in which the future has been anything more than expectations and imaginings experienced now. So the past and the future are just qualities of certain experiential contents experienced now, timelessly. The 'past' is the qualities of definiteness, unchangeability, low resolution, etc., characteristic of memories experienced now. The 'future' is the qualities of openness, uncertainty, vagueness, etc., characteristic of expectations and imaginings experienced now. Past and future and, therefore, time itself, are but qualities of experience insofar as we can directly reference them. Time is a cognitive construct, a story we tell ourselves now. Any other view of time is theory and abstraction, themselves constructed in consciousness. Timeless experience is not, as claimed by Schneider, an oxymoron. Instead, timelessness is precisely an intrinsic, fundamentally unavoidable property of every possible experience. To see it, one just needs to introspect and reflect a little more carefully and rigorously than ordinarily. I have elaborated more extensively on this crucial relation between spacetime and idealism in The Idea of the World. There, I also tackle the apparent contradiction between the notion that spacetime is experiential and the analogy I often make between experience and excitations of universal consciousness (after all, excitation, which we usually visualize as vibration, seems to require an a priori spacetime framework within which to unfold). The ontological status of spacetime is an important issue for idealism; one that is seldom discussed. I try, for the first time, to rigorously and explicitly address it in The Idea of the World. That Schneider now published an essay touching precisely on this issue was a welcome synchronicity, which will hopefully bring more attention to the issue in academic circles. "Well, think of it: Where's the past? Is it anywhere out there? Can you point at it? Clearly not. So what makes you conceive of the idea of a past? It is the fact that you have memories. But these memories can only be referenced insofar as they are experienced now, as memories. There has never been 'a moment' in your entire life in which the past has been anything more than memories experienced now." Alan Watts expands on that in the talk "Time and the More it Changes". He goes on to point out how we live life feeling as if we "come from the past", and that the past somehow seems to "determine the present". It sounds silly, yet it's hard to shake that impression. So then he goes on explaining how it is completely the other way around. This talk is great, it is really exciting and freeing when contemplated. This is the clearest explanation of time and experience I've read. Thanks, Bernardo! Einstein gave us SR and GR, Bernardo is on the way to discovery of ER ... the Experiential Theory of Relativity, tying experience together with Einstein's space time (not as easy as it sounds). Very clear, Bernardo, thanks for this text. The "welcome synchronicity" is the recursion point to get the timeless loop. Did you look the thesis of Ranulph Glanville ? Hi Bernardo. Long time no talk. When you say, “time is a cognitive construct,” you are making of time a phenomenon. But how can a phenomenon arise without time already existing? You can’t logically posit a construct without also positing the event of its construction, and this necessitates time, even if said event is eternal. To put it differently, saying that time is an effect of mind—i.e. that mind produces the illusion of time—is illogical, because any causal process implies temporality. How could a causal connection obtain outside any temporal framework? If ordinary chronological time is an illusion, the illusion can only arise within a deeper temporal structure (something like Whitehead's Concrescence perhaps). But there is no coherent conception of mind, consciousness, or experience, that doesn’t presuppose the existence of time. This is why I believe that panpsychism trumps idealism and materialism. Einstein's Block Universe, Julian Barbour's timeless formulation of physics, and others, indicate that not only physics is consistent with there being no actual time, but that time must be an illusion in consciousness (granted that others, such as Lee Smolin, say that time is all there is, space being an illusion). David Eagleman's experiments show quite compellingly that time is a cognitive construct. None of this contradicts logic or even causality in a deeper sense, since the patterns of logic and causality can be encoded in timeless form, just as the pattern of a fractal can be fully encoded in an equation. Even easier is to imagine time simply as a spatial dimension that we are forced to traverse monotonically: the patterns of logic and causality are all encoded in space, timelessly. What we call causality is then simply a partial view of a pattern that is fully present already "from the get-go," like listening to notes in a song already fully imprinted on a CD from the get-go. In the essay above, I tried to explain why this is consistent even with intuition, provided that we introspect deeply and rigorously enough: ALL of our experiences are, in fact, outside time, in the "eternal now," for the past and the future are always experiences (memories and imagination, respectively) in the now. It is thought that extends the now into a seeming timeline, but even this thought is experienced now and now only. You wrote: "Even easier is to imagine time simply as a spatial dimension that we are forced to traverse monotonically: the patterns of logic and causality are all encoded in space, timelessly." Who or what are “we” in this sentence? How are “we” being “forced” to experience things in a certain way? How is our localization in the spatial dimension of time determined? I ask because it is only through actual embodiment in this dimension that “experience” can be spoken of in any way that makes sense. Experience is inconceivable without this “we”—this monotonic point of view—that is traversing space and time. Your metaphor of time as a spatial dimension implies, yet again, a pre-existing flow of time. And so does the idea that thought “extends” the now into a “seeming” timeline. How could this extension, and the resulting "seeming," take place without happening as an event? I simply can't see how you could develop a coherent concept of consciousness and/or experience without presupposing change and difference, hence time. Physicalists have no problem positing block universes and timeless patterns because they are taking consciousness out of the equation, if only heuristically, to get the job of science done. They are dealing with ratio, i.e. time abstracted out of experience. They are doing physics, not metaphysics. That was the basis of Bergson's objection to Einstein, which is enjoying a well-deserved comeback these days: https://www.npr.org/sections/13.7/2016/02/16/466109612/was-einstein-wrong. Language has time intrinsically built into it, so the very moment I write something down I have to implicitly use the concept of time, metaphorically as the case may be in the context of my argument. Experience only requires discernible states, not necessarily time. Your argument that it does begs the question. For instance, all states in an infinite Mandelbrot set are already implicitly discernible in a simple equation (fc(z)=z^2+c), even prior to any dimensional extension through picture-making. All this aside, to entertain my point of view, and therefore be able to engage in a productive discussion, one would have to be prepared to at least try and step back, for the sake of argument, momentarily, from one's preconceived notions of spacetime and time-bound causality. If, instead, one digs one's proverbial hill's into those very notions, the result is unavoidable: one will just convince oneself more and more of one's starting notions, by assuming that which one wants to demonstrate, and then unsurprisingly arriving at the conclusion one expects to arrive at. I propose we move this discussion over to the forum if you want to continue. Blog comments don't seem to be a suitable medium for this. Hi Bernardo, I'd like to comment on the article and say that it very nicely shows the subject of experience. I would like however to note that the article is a tad bit too convulated than it need be, which can be solved quite easily by pointing out the difference between "experience" before and after spacetime's unfoldment - or more precisely, the difference between the "universal consciousness" and our own consciousness. Just elaborate a bit on why experiencing spacetime is different than the experience that had been before spacetime - I'm positive you understand what I'm talking about. Oh and by the way, I don't understand why you contrast panpsychism to idealism, as from what I understand aside from your "Absolute" aspect, both views are quite the same. Hi Bernardo, I am currently in a debate with some materialists and I am having a technical problem with your statement, “Consciousness is that which experiences.” I need your help because this statement violates the grammatical rule against dangling participles. A dangling participle is a type of ambiguous grammatical construct whereby a grammatical modifier could be misinterpreted as being associated with a word other than the one intended, or with no particular word at all. The sentence is like saying “My sister works at a restaurant where she washes.” Does she was dishes? Her hands? Or both? Before I read the above article I thought you meant to say “Consciousness is that which experiences time,” but that’s not right. I am trying to make the following post with the problem patched: “Definition of ‘living’: Let ‘consciousness’ be a fundamental irreducible primitive. In reality, there is just consciousness and its activity… nothing else exists. Consciousness is that which experiences the present moment. A living thing is a fragment of consciousness experiencing awareness as a dissociated process. A rock is precipitate of consciousness that experiences the present moment, but it is not living because it is not aware. A tree is living because it is aware. If you think that the Sun is more like a tree than a rock, then it is living.” Does this look okay?